Your Vote Counts ... Or Does It? Every election, we're admonished to be sure to vote, because an election can hinge on a single vote. We guess that's true, but more often, it isn't. And it certainly isn't as much fun as finding out how many dead people are voting. 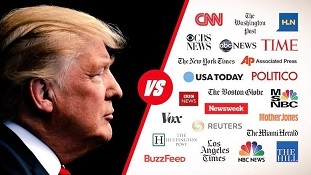 Yesterday, more than 300 newspapers coordinated articles criticizing President Trump ... just after he'd accused them of coordinating articles criticizing President Trump. Many television and radio "talking heads" have proudly announced that they aren't going to vote in Tuesday's election, because they're disdainful of the Presidential choices. Some folks believe we're doomed, no matter what the results of the 2016 U.S. Presidential elections. Others find the whole thing highly entertaining, if a bit disgusting. Liberal fanboys say, "Oh, wrong computer equipment. No harm, no foul." But if you understand anything about classified information, and the enormity of the foreign powers' successful hacking regimes, the significance of many thousands of intercepted emails is clear. And frightening. What's the big deal with the upgrade of CornerBarPR.com® to version 2.0? Oh, my. You might have to upgrade really old browsers, but now you can access us on all the Internet devices -- desktop computers, laptops, iPads, cell phones. And CornerBarPR.com uses the latest rendering (HTML 5) and encryption (TLS 1.1 and 1.2) standards and technology, which gives you a far better user experience and wildly enhanced safety and security. And for all those suppliers who have been trying to sell us search services or site optimization or marketing consulting, that's a bad thing. As it is for those who want to sell us promotional products or sales tools (or, certainly, those folks who believe our personalities need a makeover!). Because we're in the midst of a major site overhaul, and certainly don't want to promote the current version of CornerBarPR.com® until more of our improvements are in place.